Sukhoi Su-47 Berkut (in Russian: Су-47 Беркут - Golden Eagle) (NATO code name: Firkin), also designed as S-32 and S-37 during initial development, this is a supersonic fighter developed by Sukhoi. Distinguishing feature of this aircraft is the sweeper front wing, similar to Tsybin LL-3, which gives this aircraft amazing agility. At the time of production of this plane is not realized, the only plane which is produced is used as a demonstration of advanced technologies prototype for a number of technologies which are then used in the Russian 4.5 G fighter aircraft, Sukhoi Su-35 Flanker-E and the latest Russian 5G fighter jet prototype, Sukhoi T-50 PAK FA. The aircraft initially known as S-37 then Sukhoi redesigning this sophisticated experimental aircraft called Su-47 in 2002. 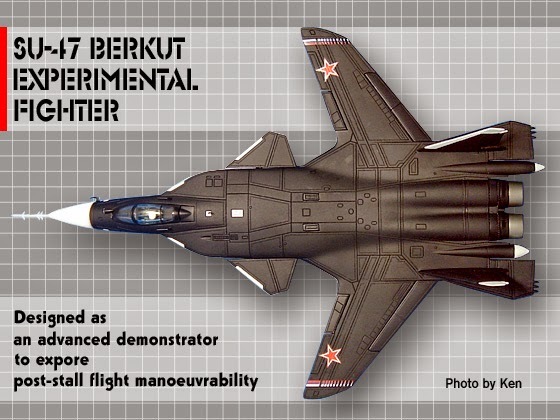 Officially has a nicknamed Berkut (Golden Eagle), the Su-47 originally created as main Russian testing aircraft for composite materials and sophisticated fly-by-wire control systems. TsAGI has long recognized the advantages of the front sweeper wing, by the research that included the development of Tsybin LL and assessment of the Germans Junkers Ju 287 were captured in the 1940s. The front sweeper wing generate larger of maximum lift coefficient, smaller bending moment, and delayed stall when compared to conventional forms of wings. When a large angular attack carried out, the ends of the wings are not loose and allow the aircraft to hold aileron. Instead, sweep forward geometrically produce outer wing angle of incidence greater when the wings bend under load. The result is a larger lifting force, more massive capacity, the angle of incidence is greater, and so on. The wings will tend to fail structurally at lower pace than straight wings or aft wings. The weakness of front sweeper wing is overcome by making twisting downwards because they (straight wing and aft wing) bend upward. This part is made from composite materials such as the Su-37, but it can also be replaced by conventional materials. This project was launched in 1983 as the order of the Soviet Air Force. But when the Soviet Union broke up, the funding be halted and the aircrafts development continued only with the Sukhoi self-funding. As rivals equivalent from the United States, Grumman X-29, Sukhoi Su-47 Berkut basically is the technology demonstration for Russian's future fighter jets. But, now trying to market the Sukhoi Su-47 to the Russian military and foreign consumers as a manifestation of the original right. Su-47 has the same size as the previous Sukhoi fighter aircraft, such as the Su-35. To reduce development costs, the Su-47 borrowed the forward fuselage, tail erect, and landing gear of the Sukhoi Su-27 Flanker. However, this aircraft features include its derived-identifier radar (including radar absorbent materials), the inner curve of arms, and space is set aside for a much more sophisticated radar. 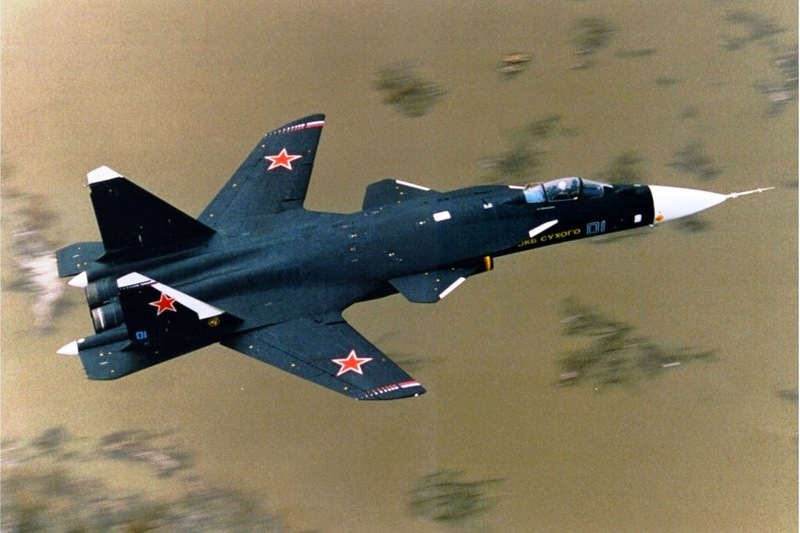 Although conceptually this Russian jets entirely almost similar to the 1980s United States research aircraft Grumman X-29, but the Su-47 sized double and closer to actual combat aircraft compared to the X-29. To overcome the wing twisting problem, Su-47 using composite materials that carefully tailored to resist twisting while allowing the wing to bend to improve the aerodynamic behavior. Because it has a relatively wide wing span, the Su-47 is equipped with wings that can be folded to fit in the hangar in Russia. Like its predecessor, the Su-37, the aircraft has a triple-tandem display, with a front canard wings and tail. Interestingly, the Su-47 has two pole-tail which has a different length out of the exhaust muzzle. Shorter pole, on the left side, is home to the radar that leads to the back, while the longer pole be a place for brake parachute.